Originally a novel by Stephen Chbosky, The Perks of being a Wallflower has been described as a coming-of-age story set in the early 1990s, shot like a faded Polaroid and aimed at an audience of modern teens who will no doubt be fascinated by how young people made their own entertainment in those far-off days before Tumblr and Glee. It was sad and emotional but really good. The actors portrayed their characters really well, especially Logan Lerman who stared as Charlie. He's character carrying a mental illness and tragic past. 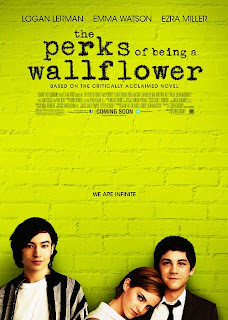 Charlie moves to a new school where he feels no one notices him until he joins forces with step-siblings Sam (Emma Watson) and Patrick (Ezra Miller). Hearing mixed messages about the book I was interested to see how the movie was gonna turn out. After hearing that the book was rude and had some perhaps older scenes I was glad that I ended up liking the movie that didn't cross any lines. I'd perhaps recommend it for a 12+ audience, 12 for the youngest maybe as it sometimes covers mature topics. I personally enjoyed it and thought in a sense that it was an inspiration film that was sad but kinda left you with a warm feeling if you know what I mean. 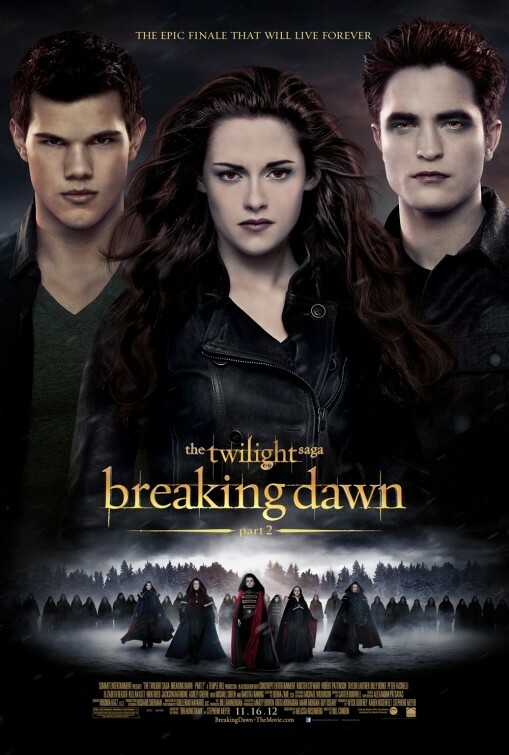 "Bella is new and improved as a vampire after childbirth killed her mortality. And although her union with Edward was fully accepted amongst the vampire community, their new baby Renesmee (a composite name of Renee, Bella's mother, and Esme, Edward's "mother") wasn't so lucky. After a false accusation, the new family is in grave trouble with the powerful Volturi who only happen to be the largest vampire regime. Even still, the Cullen's are prepared to use their special gifts against anyone who threatens their family." OMG OMG OMG X 100. I don't know how to explain my love for The Twilight Saga! Ever since I watched the first movie which inspired me to later on read all of the books, I have been Obsessed! Having watched and read all of them I was so overwhelmed with joy to be seeing it today. Especially after hearing that the ending was fabulous and different to the expected (SPOILER ALERT) book ending. I guess all of us Twi-hearts have been highly anticipating the arrival of the final instalment in which Bella is finally a Vampire and married to the to die-for Edward Cullen, the couple now adding their half-human and half-vampire baby Rennesmee to the family. And let me say Bella is 10x's cooler as a vamp and Edward is even hotter (I know right, who knew that was possible). Now, let me just try to express my love for this movie. I personally think it was the best movie I have ever seen in my whole life time and I give it 100 stars. It was the perfect way to say goodbye to our favourite saga and remember all the ones before and still manage to be exciting and full of action and romance. But the best thing was the Ending that left the cinema in absolute awe. There is just no way to describe it. I don't want to spoil it so I bet to leave it at absolutely amazing and unexpected, full of a whirlwind of emotions. I know most people out there either hate it or are in my category, absolute fanatic. I am and have always been TEAM EDWARD all the way. I mean don't get me wrong Taylor Lautner is a hottie and he has killer abs but I love Robert Pattinson and Edward Cullen is just extremely dreamy and mysterious with such a lovable personality. "The storyline is more witty, interesting, cleverly done and the action scenes are completely unexpected." I completely recommend this movie whether your a Twi-heart or not because it was the best, I want to see it 10 times and can't wait for the DVD release. It was just 100% amazing and just WOW. And don't think it's just because I am a crazed fun but for the fact that is was so good. I would give it a 100 stars but I don't have time to generate an image of 100 stars so I guess I will have to settle for 5/5 stars. Thank you so much to my big sis Issy and my parents, bestie Luna, and Amelia and Lauren.